The spatial resolution of 7T MRI approaches the scale of pathologies of interest in degenerative brain diseases, such as amyloid plaques and changes in cortical layers and subcortical nuclei. It may reveal new information about neurodegenerative dementias, although challenges may include increased artefact production and more adverse effects. We performed a systematic review of papers investigating Alzheimer’s disease (AD), Lewy body dementia (LBD), frontotemporal dementia (FTD) and Huntington’s disease (HD) in vivo using 7T MRI. Of 19 studies identified, 15 investigated AD (the majority of which examined hippocampal subfield changes), and 4 investigated HD. Ultrahigh resolution revealed changes not visible using lower field strengths, such as hippocampal subfield atrophy in mild cognitive impairment. Increased sensitivity to susceptibility-enhanced iron imaging, facilitating amyloid and microbleed examination; for example, higher microbleed prevalence was found in AD than previously recognised. Theoretical difficulties regarding image acquisition and scan tolerance were not reported as problematic. Study limitations included small subject groups, a lack of studies investigating LBD and FTD and an absence of longitudinal data. In vivo 7T MRI may illuminate disease processes and reveal new biomarkers and therapeutic targets. Evidence from AD and HD studies suggest that other neurodegenerative dementias would also benefit from imaging at ultrahigh resolution. MRI is an important clinical tool used to rule out reversible causes of dementia and to aid in the diagnosis of early dementias or those presenting in an atypical manner.16 Neuroimaging dementia research is largely concerned with the discovery of new biomarkers with such aims as earlier diagnosis, identification of ‘at-risk’ individuals and those with ‘prodromal’ dementia syndromes, monitoring of disease progression and identification of new treatment targets by illuminating the natural history of the disease in vivo. Increasing static field strength (B0) from 1.5T to 3T has allowed imaging of macro and microstructures in the brain, for example, analysis of whole hippocampal volumes and differentiation between hippocampal subfield volumes in health and disease.17 However, even at 3T, MRI voxels typically measure millimetres. Consequently, the resulting images remain several orders of magnitude away from the size of pathologies of interest; cortical layers, hippocampal subfields, brainstem nuclei, plaques, tangles and microbleeds are typically measured in micrometres. Seven tesla MRI may allow increases in image resolution, allowing us to visualise these microstructures and pathology in vivo. Seven tesla MRI creates both opportunities and challenges for the neuroscience community (see the work of Balchandani and Naidich18 for a technological summary of 7T MRI capabilities). In theory, image resolution increases by around 30% as B0 increases from 3T to 7T. The relationship between image resolution and B0 is complex, because resolution is determined by a number of factors, including signal-to-noise ratio (SNR), voxel size and image acquisition time. Theoretically, SNR increases linearly with increasing B0 and should more than double as B0 increases from 3T to 7T. However, in practice, maintenance of field homogeneity becomes more challenging; spatial and intensity distortions occur more commonly as B0 increases. Contrast between tissue types also determines image resolution and is influenced by such factors as T1, T2 and T2* relaxation times and sensitivity to susceptibility (phase difference between tissues). Newly developed technologies and imaging protocols can overcome some of the challenges previously described; for example, advanced B0 shimming and small voxel volumes have been found to compensate for increased field inhomogeneity. New radio frequency (RF) pulse sequences are also required, because as B0 increases to 7T, the wavelength of the RF is close to the diameter of the head, leading to signal drop-out and contrast changes in brain peripheries.18 Areas of interest in dementia research include small peripheral brain regions such as the hippocampus, entorhinal cortex (ERC) and amygdala, areas identified to play a large role in postmortem histological studies.20 Due to their small size and complex internal structures, such regions are likely to benefit from higher resolution imaging; however, they are also brain most difficult to examine using MRI due to artefact production. The aim of this literature review is to systematically describe and evaluate published studies that have used 7T MRI in vivo in subjects with neurodegenerative dementias. Gaps in the current literature and potential future applications for this technology in neurodegenerative dementias will then be discussed. The initial search was completed on PubMed using the following terms: ‘7T’ OR ‘7 Tesla’ OR ‘seven tesla’ OR ‘ultrahigh resolution’ AND ‘MR’ OR ‘MRI’ OR ‘magnetic resonance imaging’ AND ‘neurodegen*’ OR ‘Mild cognitive impairment’ OR ‘MCI’ OR ‘Alzheimer’s’ OR ‘AD’ OR ‘Lewy body dementia’ OR ‘LBD’ OR ‘Parkinson’s disease dementia’ OR ‘PDD’ OR ‘Frontotemporal dementia’ OR ‘FTD’ OR ‘Huntington*’ OR ‘HD’. Papers published between 1 January 1985 and 1 December 2016 were searched. These search criteria produced 393 results. Articles reviewed were limited to those related to in vivo human studies, and only papers in English were included. Relevant papers were identified by manual review of titles and abstracts. Sixteen relevant studies were identified. The reference lists of these papers were searched to identify further relevant papers, and 3 further relevant studies were identified, yielding a total of 19 papers (figure 1). Flow diagram depicting the systematic review process. Papers identified fell broadly into four groups: those reporting medial temporal lobe structures, those reporting vascular changes (microbleeds and microinfarcts), those investigating markers of amyloid and other papers. In all papers, AD was defined according to the NINCDS-ADRDA (National Institute of Neurological and Communicative Disorders and Stroke–Alzheimer’s Disease and Related Disorders Association) criteria,2 4 and in studies with a mild cognitive impairment (MCI) group, this was defined according to either the NIA-AA (National Institute on Aging–Alzheimer’s Association) criteria23 or Petersen criteria.24 Additional criteria, such as minimum Mini-Mental State Examination (MMSE) score and an adequate level of English comprehension, were stipulated in some studies. Only one paper directly compared results obtained using 7T and 3T MRI34; statistically significant differences in microbleed prevalence were seen between controls and AD/MCI using 7T only. Four in vivo 7T MRI studies including individuals with HD and/or premanifest HD were identified (table 3). Definitions of HD and premanifest HD were not consistent within these papers. In all cases, patients were positive for HD mutation with ≥40 CAG repeats; however, divisions between premanifest HD and HD were defined according to Unified Huntington’s Disease Rating Scale motor score,36 and various cut-off values were chosen. Two papers measured iron deposition in basal ganglia structures, one paper investigated changes in the blood–brain barrier, and one paper reported on a quantitative textural analysis. Similar to the AD amyloid-deposition papers previously described, the HD papers investigating iron deposition used T2*-weighted GRE acquisition sequences and reported in-plane resolutions of 0.5 and 1 mm2. Image susceptibility increases in the caudate nucleus (suggesting greater iron deposition) were reported in premanifest HD,37 38 and were found to correlate with the CAG-Age Product Scaled (CAP) score39 (used to estimate the probability of progression to clinical HD within 5 years). One paper commented on scan tolerability and adverse effects,37 and in this study, six participants (three patients and three controls, 20% of participants) were excluded as they did not tolerate 7T MRI; however, the reasons behind this were not elaborated on. The hippocampus is not a uniform structure—it consists of multiple subfields (CA-1, 2, 3 and 4, subiculum and dentate gyrus.40 Postmortem studies suggest early involvement of ERC, subiculum, CA1 and dentate gyrus in AD,41 and hippocampal atrophy is well established as a biomarker for AD.42 It is possible to delineate the subfields of the hippocampus using 3T MRI in vivo; at 1.5T and 3T CA1, CA2 and subiculum atrophy (using both field strengths to image the same participants) was found in AD but not in MCI.17 In this paper, improved SNR and greater effect sizes were noted at 3T (compared with 1.5T), suggesting that a similar further improvement might be seen with an increase of B0 to 7T. Papers reviewed here found significant atrophic changes in MCI compared with controls,26 28 43 suggesting that improved resolution, SNR and consequent increased effect size has real benefits, allowing differentiation of MCI and AD from controls at 7T. Changes in CA1-SRLM width in mild AD in the absence of differences in total CA1 or total hippocampal widths were also reported, possibly demonstrating very early changes, previously undetected on MRI.35 The average between group difference in CA1-SRLM in this paper was around 1 voxel, therefore, at the limit of detectable changes, further emphasising the advantages of 7T MRI. MCI is of particular interest in AD research, accurate identification of which in this group develop AD may allow earlier diagnosis and allow the targeted treatment of ‘prodromal AD’ before substantial memory and functional deficits are apparent. As suggested by postmortem findings, the papers reviewed here consistently report reductions in CA1 (specifically CA1-SRLM); however, there was less consensus regarding changes in other subfields. For example, Kerchner et al found that hippocampal volume reductions were restricted to CA1-SRLM,35 while Wisse et al noted volume reductions throughout the majority of subfields.28 Imaging protocols were reported to be similar in these studies, and differences in segmentation approaches, different degrees of dementia and small numbers of subjects may account for the lack of consensus. There is consensus in the papers reviewed that 7T MRI produces images of sufficiently high resolution to allow improved visualisation of hippocampal substructures in vivo. However, while high in-plane resolution allowed visualisation of the fine detail of the hippocampal formation, due to the trade-off between high in-plane resolution and slice thickness, it was not possible to use differences in microstructure to segment the hippocampal formation throughout the length of the hippocampus in vivo. Protocols described in these papers resorted to macrostructure rather than microstructure to differentiate between some of the subfield layers (eg,31). Most of the studies reviewed described their participants as ‘mild’ or ‘early’ AD, and many stipulated that all participants have a minimum MMSE of 20. This is likely due to the practicalities of imaging subjects with more advanced AD (issues include consent, compliance and excessive within-scanner movement) and may mean that results are not generalisable to the wider patient population. Versluis et al suggested that the challenge of increased artefact production due to movement can be largely overcome by modifications of image acquisition sequence and in postprocessing.44 A navigator echo was used, in which physiological movement such as that caused by respiration and pulse is tracked using additional RF pulses, and a correction for this is factored in when the MRI signal is converted into k-space. Excessive motion artefact can also be corrected prospectively, for example, using an optical tracking system where a marker is attached to a dental plate, which is held in the subject’s mouth.45 However, such methods require an extremely cooperative participant and may be uncomfortable, and for patient participants in dementia studies, such methods may not be ideal. None of the reviewed papers reported serial MRI changes at 7T, which is an established biomarker for clinical trials.46 A lack of longitudinal data limits our understanding of how the changes seen relate to the natural history of these diseases. For example, Wisse et al investigated whether ERC and hippocampal degeneration induced degeneration of associated WM tracts43; however, investigating the likely order of events within a disease process without using longitudinal data means that conclusions are difficult to reach, and in this paper, it is possible that WM tracts degenerate first, causing associated cortical tissue regions to atrophy in a proportional manner. Hippocampal subfield pathology is also reported in Parkinson’s disease, PDD and LBD. On postmortem, hippocampal pathology is seen primarily in CA2, CA3 and dentate gyrus rather than CA1, which is primarily affected in AD.47 Findings from in vivo MRI studies are conflicting. At 1.5T MRI, atrophy has been reported in CA1 and subiculum in LBD compared with controls.48 At 3T MRI, CA1 has been found to be relatively preserved in LBD compared with AD and not to differ significantly from controls, while significant reductions have been found in whole hippocampal volumes and in CA2-3 in both LBD and AD compared with controls.49 The differentiation between hippocampal subfields on MRI has proved difficult at 1.5T and 3T,50 which may account for differing results between studies. Seven tesla MRI, which begins to approach the scale required to illuminate the histological changes seen in postmortem studies, may be beneficial in confirming to what extent hippocampal subfield volume measurements differ between AD, LBD and controls. In this review, we did not identify any published studies examining hippocampal subfields in LBD or FTD using 7T MRI. Amyloid plaques are a cardinal feature of AD, seen initially in the basal neocortex and later widely distributed throughout the cortex.3 PET has been highly successful in imaging neural amyloid deposition using amyloid-binding ligands such as 11[C]PiB.51 One major advantage of developing a method of imaging amyloid using in vivo MRI lies in its much higher spatial resolution; specific identification of where in the brain amyloid is deposited at each stage of the disease process may be possible. Advantages of 7T over 1.5T MRI in the direct visualisation of microbleeds has been demonstrated. Microbleeds were detected in significantly more patients with atherosclerotic disease using 7T MRI (50% of subjects) than using 1.5T (21% of subjects).57 A review of 1.5T MRI studies suggested that microbleed prevalence in AD is around 23%.58 Imaging at both 3T and 7T in the same subjects, Brundel et al reported a microbleed prevalence of 33% in AD at 3T (difference from controls was not significant) and of 78% at 7T (with a significant difference between AD and control groups).34 The increase in in-plane resolution was from 0.99×0.99 mm at 3T to 0.5×0.5 mm at 7T. This paper suggests that increasing B0 to 7T allows the visualisation of pathology not previously evident via MRI. The 7T in vivo HD studies investigating iron deposition in premanifest HD34 37 used techniques similar to those previously described for imaging amyloid and microbleeds in AD and MCI. Findings suggesting increased neural iron in basal ganglia structures, including the caudate nucleus, mirror those found at lower field strengths and at postmortem.61 While using susceptibility effects as a proxy for iron burden corresponds well to prior postmortem findings, susceptibility effects in MRI may be caused by a number of different substrates, as previously described. Calculating apparent spin–spin relaxation rate (R2*) has been validated as a quantitative measure of iron in brain tissues.62 As R2* signal increases with B0, this is a further potential benefit of 7T imaging. van Bergen et al reported increased R2* values in the caudate and putamen in premanifest HD but not in other basal ganglia structures, and effect sizes were smaller than those seen when using QSM.38 This might indicate that iron is only one contributor to the susceptibility effects seen in the basal ganglia in this study, and the authors suggest demyelination may also contribute. Many of the papers included in this review have benefitted from the increased sensitivity to susceptibility seen at 7T and have used this effect to variously measure amyloid, microbleeds and iron deposition. That the same or similar techniques, including QSM, SWI, R2* and phase shift, have been used to measure different processes is problematic, implying a lack of consensus regarding which pathological processes are actually producing changes in these measures on MRI. Ongoing research comparing histological findings, postmortem MRI and polymodal imaging (eg, comparing amyloid PET with ultra-high-resolution MRI) may provide future clarification. A major limitation of HD papers in this review is the variable definition of premanifest HD versus HD. Each HD paper used different UHDRS motor score cut-off values. A lack of consistency within the literature complicates between-paper comparison and makes it difficult to correlate MRI biomarkers with clinical findings. No in vivo studies using 7T MRI in neurodegenerative dementias other than AD or HD were identified in this review. Proportionally, more dementia cases are identified as LBD on postmortem than are diagnosed clinically,63 suggesting that LBD is under-recognised and may benefit from the identification of biomarkers to facilitate diagnosis in life. A lack of 7T MRI LBD studies may reflect the novelty of 7T MRI, the dominance of AD research, the relatively few individuals diagnosed with LBD compared with AD or the specific difficulties of imaging in this patient group, in which fluctuating alertness and movement disorders are core clinical features. Postmortem and imaging studies have identified changes in small, complex brain structures in LBD, for example, in hippocampal subfields, substantia innominate, putamen, pons and thalamus.10 48 Similar to the hippocampus, the thalamus is extremely complex structurally, and success has been reported in differentiating its substructure using 7T MRI in cognitively normal subjects.64 The AD studies in this review suggest that the challenges of imaging small, peripheral brain areas can be overcome with specialised acquisition sequences. Increased ghosting, artefacts and image drop-out do not appear to be as problematic as predicted. This suggests that areas of interest in LBD, such as the thalamus and basal ganglia, may benefit from 7T imaging in a similar way. No FTD studies were identified in this review. Although less common than AD or LBD, FTD is particularly important clinically due to its over-representation in younger onset dementias.65 The heterogeneous nature of FTD both clinically and pathologically and the relatively small numbers of individuals affected by this type of dementia may contribute towards this deficit. Distinct atrophic changes in the frontal and anterior temporal lobes is described for all subtypes at 1.5 and 3T.66 As is the case for AD and LBD, imaging at ultra-high resolutions may be beneficial in describing the disease processes more fully in vivo and in developing biomarkers that can be used to monitor disease progression, guide prognosis, and be used to evaluate the effects of any potential treatments. 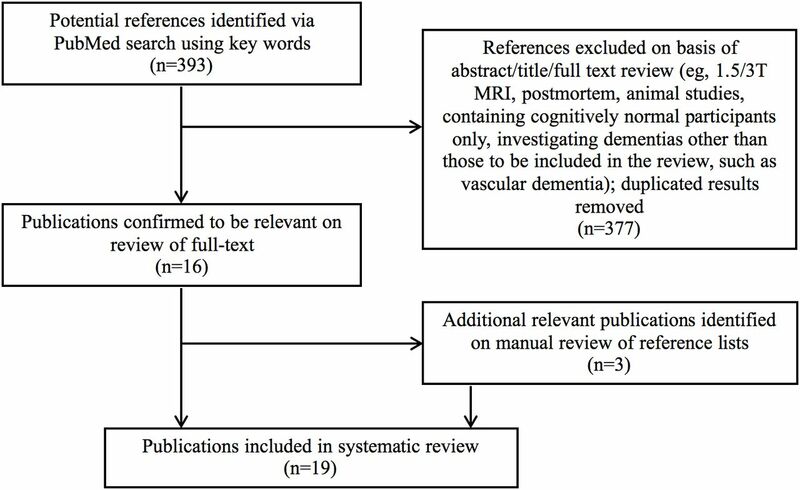 This systematic review identified 19 papers using 7T MRI in vivo to investigate neurodegenerative dementias. Fifteen of the papers identified were concerned with AD, and the majority investigated hippocampal subfields. Four of the papers identified were concerned with HD and/or premanifest HD. The papers, in general, have four main limitations. First, participant numbers are small, which limits the power of these studies. Second, studies to date have been limited to AD/MCI and HD/premanifest HD. Third, none have taken a longitudinal approach. Finally, few of the studies related imaging findings to detailed neuropsychological/cognitive testing. A great advantage of in vivo over postmortem studies is the ability to link imaging findings to the clinical syndromes experienced by patients. The relevance of studies that do not explore the relationship between imaging and clinical findings may be limited. It is likely that as 7T MRI becomes more widely available, studies will include larger samples and produce longitudinal data, allowing researchers to examine the changes seen as dementias develop and illuminating prognoses, for example, by identifying which individuals with MCI will go on to develop AD. In the small number of papers as yet published, the predicted challenges of ultrahigh resolution, such as increased artefact production, ghosting and image drop-out, are not much commented on in the papers. This implies that practical difficulties are less troublesome than the theory would suggest, and new technologies can overcome at least some of the issues. Total scan times were reported in 14 of the 19 papers reviewed and varied greatly according to the acquisition sequence used, FOV and voxel size. Increasing B0 allows faster acquisition times or increased resolution. In these papers, authors have not consistently sought to draw on one or the other of these potential benefits. We may conclude that consensus on ideal imaging parameters at 7T in the dementia population has not yet been reached. Of the papers reviewed, only three reported on scan tolerability or adverse effects for subjects, despite the theoretical increased risks at 7T compared with lower field strengths. The low attrition rate in the studies and the lack of reported side effects may lead us to conclude that adverse effects were not often experienced by subjects in these studies. However, 7T MRI in vivo remains relatively new, and the populations examined in the course of dementia research are likely to be among those who would be most at risk, so ongoing vigilance is required. The lack of in vivo 7T MRI studies investigating neurodegenerative dementias other than AD and HD is perhaps surprising, though a reminder is that 7T is not widely available as yet. Results from AD studies suggest that 7T will be an important method for looking into LBD and FTD also. Like AD, LBD has much of its pathology in small, structurally complex and often peripheral brain areas. Also somewhat surprising is the lack of papers taking a multimodality approach, looking at correlations with PET, EEG or with systemic biological markers (other than APOE) such as immunological markers. Again, multimodal studies are likely to be seen as 7T MRI becomes more widely available. In summary, although 7T MRI is in its infancy, it shows great promise for neurodegenerative dementia research. Looking to the future, the literature would benefit from larger cohorts, longitudinal data, greater correlation of imaging findings with the clinical picture and research into dementias other than AD and HD. The authors acknowledge the support of the Cambridge NIHR Biomedical Research Centre.
. Neuroimaging characteristic of dementia with Lewy bodies. Alzheimer’s Res Therapy 2014;6:00 00. NICE-SCIE Dementia. The NICE-SCIE Guideline on supporting people with dementia and their carers in health and social care. 2007 (updated 2011). http://www.scie.org.uk/publications/misc/dementia/dementia-fullguideline.pdf?res=true (accessed 03 Jun 2016). Medicines and Healthcare Products Regulatory Agency. Safety guidelines for magnetic resonance imaging equipment in clinical use. 2015. https://www.gov.uk/government/uploads/system/uploads/attachment_data/file/476931/MRI_guidance_2015_-_4-02d1.pdf (assessed 02 Jun 2016). Health Protection Agency. Protection of patients and volunteers undergoing RI procedures. Documents of the Health Protection Agency Radiation, Chemical and Environmental Hazards 2008. https://www.gov.uk/government/uploads/system/uploads/attachment_data/file/329364/Protection_of_patients_and_volunteers_undergoing_MRI_procedures.pdf (accessed 02 Jun 2016). Huntington Study Group. Unified Huntington’s Diesease Rating Scale: reliability and consistency. Movement Disord Soc 1996;11:136–42.
. The human hippocampus. 3rd edn. Berlin, Heidelberg : BMJ Publishing Group, 2005.
. Using serial registered brain magnetic resonance imaging to measure disease progression in Alzheimer disease: power calculations and estimates of sample size to detect treatment effects. Arch Neurol 2000;57:339–44.
. Degenerative axonal changes in the hippocampus and amygdala in Parkinson's disease. Folia Neuropathol 2003;41:197–207.
. MRI and histological analysis of beta-amyloid plaques in both human Alzheimer’s disease and APP/PS1 transgenic mice. J Magn Reson Image 2009;29:997–1007.
. Cerebral cortical microinfarcts at 7tesla MRI in patients with early Alzheimer’s disease. J Alzheimer’s Dis 2014;39:163–7.
. Texture analysis of ultrahigh field T2*-weighted MR images of the brain: application to Huntington’s disease. J Magn Reson Image 2014;39:633–40. Contributors EFM and JTO conceptualised this systematic review. EFM performed the literature search and reviewed the papers with supervision from JTO. EFM drafted the written paper which was revised by JTO. The authors take joint responsibility for the accuracy and integrity of this work.